No savings? No deposit? Don’t worry, you can still get a home loan with a guarantor loan or with a gifted deposit. Can you buy a house with no deposit? What if you don’t have any savings? Unfortunately, there are no longer any lenders in Australia who offer no deposit home loans. However, with help from your parents, or a little creativity, you may still be able to borrow over 100% of the property value. She’s young and ready to get into the property market. One problem: she hasn’t saved up a deposit and the banks tell her that she won’t be able to get a loan. So what can Jane do? Well, she could save up a deposit, but she wants to buy a house as soon as possible. Luckily for Jane there are a number of options she can choose from. The first option is with a guarantor loan. Using a guarantor is by far the most common way for first home buyers to borrow the full purchase price. If Jane’s parents own a property and they’re willing to guarantee her loan then Jane can borrow up to 100% or possibly even more. Banks will also lend enough to cover stamp duty and other costs involved in the purchase. She doesn’t need any savings of her own, she can get a great interest rate, and she doesn’t even need to pay any Lenders Mortgage Insurance! But what if Jane’s parents don’t want to go as guarantor on Jane’s loan? That’s fine, her parents may be able to gift her a deposit. If they give her enough to reduce the loan down to 90% of the property’s purchase price then Jane may be able to qualify for a home loan with no proven savings record. However, if Jane is renting then she may be able to borrow up to 95% of the purchase price without proving a savings history. Another great idea is to check whether you are eligible for a grant. Government grants such as the First Home Owners Grant vary between states and they can be very high for new properties. By getting a government grant, you may be able to cover the deposit required for the loan! However, be careful when using a grant or a gift from your parents as a deposit. 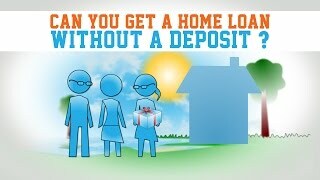 Not every lender will approve a home loan if you didn’t save up the deposit yourself. Well, Jane’s parents were happy to go guarantor for her home loan. Jane got the perfect little house by the water and is thoroughly enjoying her new home. And you could too by calling the Home Loan Experts!